What is the usual treatment for menorrhagia? How has Mens-Reduce helped other women? How do I use Mens-Reduce? Conventional treatment of menorrhagia is based on treating any underlying cause or condition or, in the many women who have no known cause, symptomatic treatment may range from oral contraceptives and other hormonal medications to surgery. Hormonal balance during a woman’s life may be influenced by a variety of factors such as nutrition, diet, lifestyle, exercise, stress, emotions, age and ovulation. Natural remedies also have a long history of use in promoting female reproductive health and hormonal balance – assisting women throughout the ages to stay healthy before and during the menstrual cycle as well as during the perimenopause and menopause – without unwanted side effects! 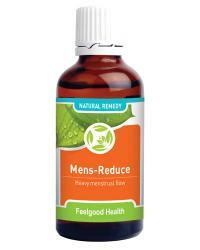 Mens-Reduce is a 100% safe and effective natural remedy for reducing excessive menstrual bleeding and regulating a woman’s cycle. The concentrated medicinal herbs and homeopathic ingredients in this remedy have been especially chosen to effectively treat both the symptoms as well as many of the underlying causes of menorrhagia, thereby helping the body to heal itself. Artemesia vulgaris is a traditional herb commonly used for menstrual difficulties and the peri-menopausal period. Considered by the ancient Anglo-Saxons to be one of the nine sacred herbs, Artemesia vulgaris is very effective in regulating menstruation and relieving menstrual pains. Capsella bursa-pastoris has been used since the 19th century for bleeding problems including blood in the urine, bruises and heavy menstruation. Calendula officinalis is used as a menstrual cycle regulator in naturopathic medicine. This herb is excellent for women who suffer from irregular periods and will also relieve pain associated with menstruation. Viburnum opulus is also known as Cramp Bark and is known to ease nervous tension as well as relax the uterus, relieving menstrual cramps. China (30C) is also known as Cinchona and is a homeopathic ingredient used to remedy anemia resulting from breast-feeding, diarrhoea or excessive menstrual bleeding. China will increase physical stamina and energy. Calc Carb (30C) is a homeopathic remedy for heavy menstrual bleeding as well as relief of swollen and tender breasts related to PMS. Sepia (30C) is excellent for treating PMS, menstrual cramps and mood swings from hormone imbalance. Belladonna (30C) is also a homeopathic remedy and is very useful for regulating menorrhagia. Contains less than 1% pure pharmaceutical ethanol when diluted as directed. Directions: Take 10 - 15 drops in 1/4 cup water three times daily. This remedy must be used every day and not only during the menstrual cycle. Improvement may be noted from the first menstrual period though it might take up to three cycles to see the full effectiveness of this natural remedy. One 50 ml bottle will last approximately 30 days. A 120-day supply (See the Buy 3 Get 1 FREE special offer) would be three bottles. Follow a healthy lifestyle to allow your body the best chance of balancing your hormones and regulating itself. Change tampons regularly even when your flow is light to avoid complications like Toxic Shock Syndrome. Don’t use aspirin as a painkiller as this can “thin” your blood and further increase menstrual bleeding. If you feel generally tired and lethargic and suspect you may be anemic, speak to your health care provider about taking an iron supplement.